Bishop Javier Echevarría was born in Madrid on June 14, 1932, the youngest of eight children. He attended a primary school run by the Marianist Fathers in San Sebastian and continued his education in Madrid at a Marist Brothers school. In 1948, at a student residence, he met some young members of Opus Dei. Sensing that he was called by God to seek holiness in ordinary life, he asked to be admitted to Opus Dei on September 8 of that year. He received priestly ordination on August 7, 1955, and worked closely with St. Josemaría Escrivá as his secretary from 1953 until the founder’s death in 1975. 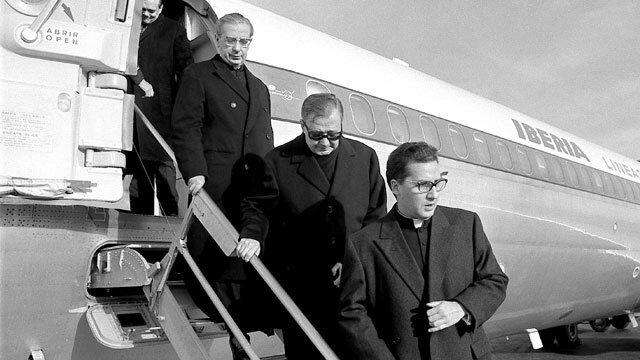 In 1975, when Alvaro del Portillo succeeded St. Josemaría, Msgr. Echevarría was appointed Secretary General of Opus Dei. In 1982 he was appointed Vicar General. After the death of Blessed Alvaro in 1994, he was elected Prelate of Opus Dei, and on January 6 of the following year he was ordained a bishop by St. John Paul II in St. Peter’s Basilica. From the beginning of his ministry as Prelate, his priorities were evangelization in the areas of the family, youth, and culture. He oversaw the beginning of the Prelature’s stable formational activities in sixteen countries, including Russia, Kazakhstan, South Africa, Indonesia, and Sri Lanka. He traveled to all the continents to give impetus to the evangelizing work carried out by the faithful and the cooperators of Opus Dei. He encouraged the founding of numerous institutions dedicated to immigrants, the sick and the marginalized, and he gave special attention to a number of centers for the care of the terminally ill.
Recurring themes in his catechetical trips and in his pastoral ministry were love for Jesus Christ, fraternal love, service to those around us, the importance of grace and the Word of God, family life, and union with the Pope. In his last pastoral letter, in fact, besides expressing thanks for the audience he had with Pope Francis on November 7, he asked—as always—that the members and friends of Opus Dei accompany the Pope with prayers for his person and intentions. He wrote many pastoral letters and a number of spiritual books, such as Paths to God: Building a Christian Life in the 21st Century; Para Servir a la Iglesia; Getsemaní; Eucaristía y vida cristiana);Vivir la Santa Misa; and Creo, creemos (I Believe, We Believe). His last book is a collection of meditations about the works of mercy, entitled Misericordia y vida cotidiana. He was a member of the Congregation for the Causes of the Saints and of the Apostolic Signatura. He took part in Synods of Bishops in 2001, 2005, 2012 and in the Synods dedicated to the Americas (1997) and to Europe (1999). He died in Rome on December 12, 2016. Romana, No. 63, July-December 2016, p. 227-229.